Inspiration is something that can easily be lost unless you are reminded from time to time. I have recently been coming up short again and again when searching for new music that gets me excited enough to write about it and share. Until I came across…. 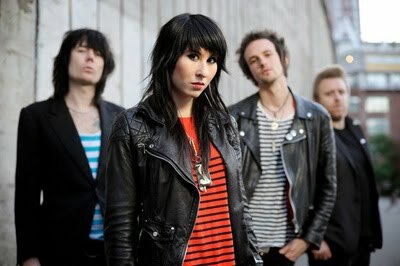 The band is called Deluka and they are a British electro/rock four piece from Birmingham. The sound? A potent cocktail of Yeah Yeah Yeahs and Duran Duran, blended with a touch of The Killers and finally topped off with smart lyrics, flawless big production, and hauntingly gorgeous female vocals tying it all together. The type of record that can bring hipsters, pop scenes, and music snobs together in agreement for once. I first saw this band live in San Francisco as they headlined the exclusive “New Twitter” private launch party. It was evident right away that Deluka was something special. I did not see one person at the party who was not either dancing around in pure dance rock ecstasy, or asking someone frantically “Who is this fantastic band?”. They were simply spectacular live and in front of one of the toughest audiences I have ever seen; who completely agreed. With that being said, the new record is out now. You Are The Night is exactly what you would expect with such a blatant title. Put this thing on when going out for the evening and it makes a lovely companion throughout your night. This is a fantastic little record that is trying to make its way through a bloated scene of current blandness. If the single “Cascade” does not breakthrough, it’s just another sign of great music falling under the radar in an extremely competitive and overly crowded landscape. Give this album a listen, they deserve your attention.